As your reliable research partner, GenScript believes that access to high-quality peptides should not be an obstacle in your research. So, we are now offering Custom Peptides with guaranteed quantity and upgraded purity at world‘s highest speed, as fast as 5 days, to expedite your research. Further more, GenScript’s Peptide Library service guarantees No charge for undelivered peptide, and extra 20% OFF will be offered if non-delivery occurs to ensure your high quality peptide library for screening. Now, enjoy more benefits with our special SALE. GenScript guarantees each peptide in a peptide library, No Charge For Undelivered Peptide. Now, more promotions for high quality peptide library to help accelerate screen research! Extra 20% off will be offered if non-delivery occurs, which could be applied for next peptide order. As world’s fastest peptide vendor, GenScript offers high quality peptide in 5 days at 100% guaranteed maximum quantity. 2. FREE peptide delivery upgrade to Fast; as fast as 5 days! With microwave-assisted PepPower™ peptide synthesis platform, GenScript can deliver peptides with industry leading speed, as fast as 5 days now. Receive fast peptides in as fast as 2-3 weeks 5 days! 3. 100% Guaranteed Quantity Delivery, at No Extra Cost! GenScript is the only peptide vendor that guarantees quantity delivery. Never worry about peptide shortfall again. 100% guarantee peptides with max quantity, at no extra cost! GenScript is the only peptide vendor that offers comprehensive solvent options to help dissolve your peptides. *All promotions above are special for peptide services, products are not included. Promotion is effective only for orders placed before Jun 16, 2019. A 20% off coupon will be sent to your account once Non-delivery or Degradation Occurs(SC1487), which is caused by limited technology. Valid for both Regular and express peptide synthesis services with a length of 4-30AA and quantity of 1-1000 mg.
Higher purity of >75% and >85% will be offered without extra charge when lower purity of >70% and >80% are selected, respectively. Price of >90% to >98% will be reduced automatically when ordered. 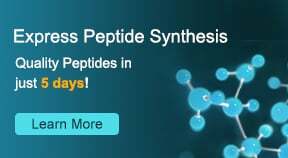 Receive Fast Peptides at Regular Price! Not valid for peptide library and array services. Promotion is not valid for peptide library and peptide array services. Our customer service representatives are available 24 hours Monday through Friday. You may contact us anytime for assistance.